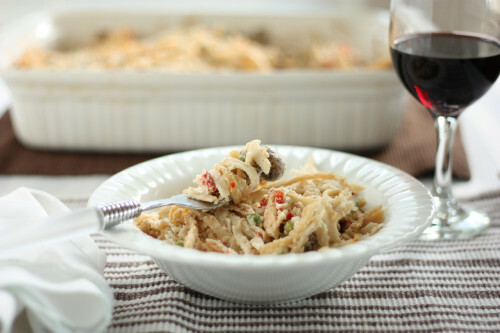 One of the comfort food and potluck staples I’ve come to enjoy is chicken tetrazzini. The creamy sauce is hard to resist, yet it is not easy on the waistline. But what is the best way to make this dish in a healthier manner? My friend Kim Van Dunk of Life in the Van was the first to get my wheels spinning for this recipe. She has created an award winning pot pie which uses cauliflower as a main part of the sauce. What an inspiration! I had tried the popular cauliflower pizza crust (a pinterest favorite) last year and knew if was possible to make cauliflower taste like, well . . . not cauliflower. This nugget of a recipe idea was in the back of my mind when I cleaned out my desk over the New Year’s holiday break. I found I had saved this recipe from Cooking Light which gave me the idea to use evaporated milk and cream cheese to round out the flavor of my sauce, without losing consistency. The last inspiration was from a recent church potluck. Susan’s tetrazzini included pimentos, which gave it a beautiful pop of color and extra bit of flavor. The end result was a delicious tetrazzini that wowed even my cauliflower-hating husband. 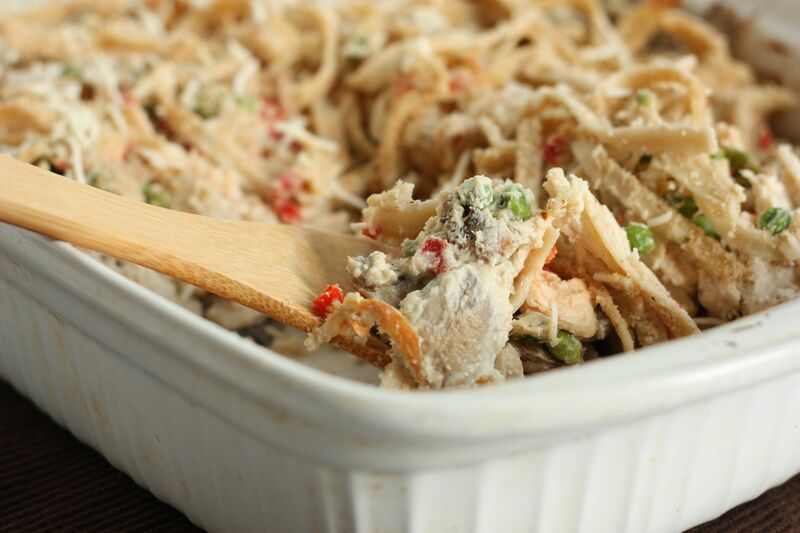 If that doesn’t sell you on trying this skinny chicken tetrazzini, then hopefully the photos will! Place the cauliflower in a large pot and cover with water. Boil over medium heat until florets are soft, about 15 minutes. Drain and add the cooked cauliflower to a food processor. 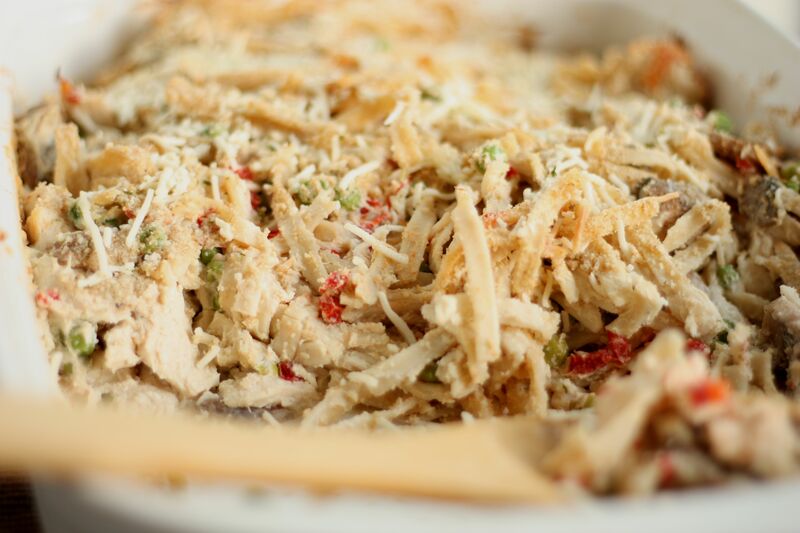 Process until finely chopped, then add the evaporated milk and cream cheese and process until smooth. Stir in the onion powder, garlic powder, salt, and ground thyme; set aside. Heat the butter in a large sauté pan and add the sliced mushrooms. Sauté until golden brown. While the mushrooms are cooking, cook the fettuccini according to the package directions, drain and add to a large bowl. Preheat oven to 375 °F and spray a 13-inch x 9-inch casserole pan with non-stick cooking spray. Add the cooked mushrooms, chicken, peas, and pimentos to the fettuccini and stir to mix. Pour the cauliflower sauce over the pasta mixture, stir to coat and then pour into the casserole pan. Evenly sprinkle the top of the pasta with the Parmesan and bread crumbs, then place in the oven. Cook in the oven for 40 minutes, or until heated throughout and the cheese begins to brown. P.S. 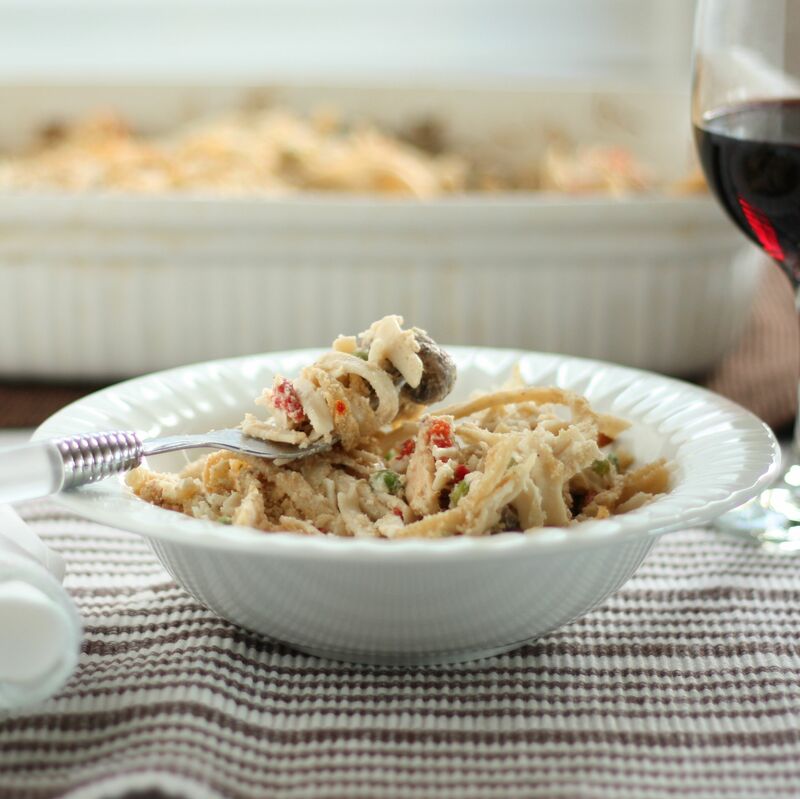 I made this recipe with gluten free noodles and amazingly they didn’t get hard. Don’t be afraid to try this gluten free! This entry was posted in Entree and tagged cauliflower, gluten-free, pasta, vegetables. Thanks for the shout out, Jackie! This looks really delicious. Yet another great use of cauliflower. I’m gonna try this! I can’t wait to hear what you think, Kim! This looks great, love finding skinny versions of favorites!